Over the last several months life aboard Discovery has been very much routine, predictable in almost every respect. This may not sound very good to most people, even boring. However in space you want things to be predictable because the unexpected is usually something that can kill you. Often before you even realize there’s a problem. This is why I have become very concerned in the past few days. After months of a nice safe routine where you know everything that’s going to happen and when it’s going to happen several unexpected, unusual, things have been happening. Things have started to turn up missing. For example I put a writing pad on a console a few days ago and when I went back for it ten minutes later it was nowhere to be found. Because Hal is capable of completing the mission on his own in the event the crew is incapacitated or killed and also because we need to be able to call for his assistance at any time there are visual and audio inputs all over the ship and Hal monitors them constantly. Hal had no record of anyone else in the area at the time, as he shouldn’t have because this was during Ralph’s sleep period and Hal was able to confirm that’s where he was. The obvious problem is that somebody or something had to move that pad. It was attached to a Velcro strip on one of the command consoles. Things do not simply “fall off” of Velcro strips even under gravity and the command deck, like the rest of the ship outside of the centrifuge, is in weightlessness. What was perhaps even more disturbing is that when I went to the dining area of the centrifuge for lunch I found the pad. It was sitting right at my usual place at the table just like I had put it there. The problem is that I didn’t do it. Again, Hal can confirm that I didn’t do it. His records indicate that five minutes before I entered the centrifuge there was nothing on the table. I had not been in that area since shortly after breakfast and while Ralph was, he was asleep the entire time. Hal’s records confirm all of this. Ralph seemed to find the situation funny, making jokes about the ship being haunted. He continued to joke about it later when something of his went missing only to be found in an unexpected and completely unlikely location when neither of us were anywhere near. This has continued to happen more and more often. Ralph continues to joke about Discovery being haunted. Yesterday morning it happened again. My pad was nowhere to be found. I made it a point to search as much of the ship as I could and didn’t find it. Then an hour ago I found it. Sitting on a console, right in front of one of Hal’s “eyes”. Hal has no record of anyone putting it there. One minute it wasn’t there, the next it was. This time something had been written on it. The infamous line from the end of the first 2001 novel which was also significant in the 2010 movie. Ralph immediately said that it was because the ship was haunted. This in itself is bad enough, astronauts don’t believe in things like that, we cannot afford to. However his next statement worries me even more. Ralph claimed that not only was the ship haunted but that it was haunted by David Bowman. Of course this is ridiculous. David Bowman never existed except as a character in three science fiction novels and a couple of movies. When I pointed this out to Ralph he agreed, however in his opinion that has nothing to do with Bowman haunting the ship. I have come to the conclusion that Ralph is dead serious about this haunting business. Hal has done a psychological analysis and agrees, Ralph is not joking. Even though he laughs about it a lot the fact is that he seriously believes the ship to be haunted by David Bowman. I am very worried. Something is horribly wrong and I cannot dare trust Ralph anymore for anything. It is obvious to me that Ralph is insane. This means that it is now impossible to predict what he is liable to do or what actions, words or situations will set him off. Ralph is laughing again. Hal says he is in the pod bay, challenging Bowman to “come and get me”. As we begin the new year in deep space life aboard discovery remains the same. Because the scientific team was put aboard already in hibernation Ralph and I are the only two awake on board. One could say that Hal is “awake” in his own way but he doesn’t face the risk of boredom. Our lives are by necessity routine. We have scheduled activities every day. While Hal does monitor all systems and is quite capable of doing so on his own, Ralph and I have the task of checking various ship systems on a regular basis. This is both to double check Hal’s information and more importantly, give us something to do. Because the delay in communications will continue to increase from it’s current ten minutes one way we cannot rely on communications from home to keep us occupied. Besides which, there are relatively few transmitters on Earth capable of sending a signal strong enough to reach us in the first place. We do receive daily transmissions of news programs and a small selection of entertainment channels but mostly we rely on our on-board video library. We have enough material that we could watch three feature length movies every day and not even be halfway through all of them before we arrive at Jupiter. My day starts at 06:00 ship’s time. I have some time in which to dress, get completely awake, do twenty minutes of exercise designed to maintain fitness. By 06:30 I am having breakfast. At 07:00 my shift begins and I officially relieve Ralph and he goes over the ship situation report with me noting anything that might need attention. Through the rest of my day I go over most of the ship systems. Discovery is a very advanced, very capable ship but various instruments need to be calibrated occasionally and other systems need regular maintenance to insure they continue working their best. Besides which anything, no matter how well made, can break down. By 16:00 ships time I’ve gone through the entire official routine and I am technically “off duty” and free to occupy my time however I see fit. Some days I’ll watch a movie from the ship’s library, others I might read an ebook or perhaps engage Hal in a game or two of chess. At 18:00 ship’s time Ralph’s day, essentially a mirror image of my own, is just beginning. At 20:00 I’ll go to bed and from there the cycle repeats itself. It’s Christmas day. The first of several that we will spend out here in deep space. Last week mission control had us record a Christmas special called “Christmas in deep space” that is to be broadcast today. Ralph, Hal and I exchanged the expected rounds of “Merry Christmas” and talked about what it’s like to spend Christmas farther away from home than anyone in history. We also recorded messages to family and friends to be transmitted back home. Because of the special, their holiday messages to us were recorded and sent to us two weeks ahead of time. It was done that early not only because of the usual production work involved in such things but also because of the increasing delay in communications. At our present distance which is a little over 110.5 million miles (and getting greater at the rate of approximately 70,843 miles per hour) it takes a bit over ten minutes for the radio signal to travel from Earth to us and another ten minutes for our replies to arrive there. The basic formula is one you learn in grade school. As we get farther from Earth this time delay in communications will get longer. It is one of the reasons that we have so many redundant systems as well as literally tons of spare parts, tools and supplies for doing repairs. We are very much on our own out here and every possibility had to be planned for no matter how remote that possibility might be. 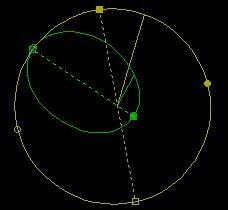 To help visualize the distances involved the yellow circle in the graphic is Jupiter’s orbit around the sun. The place where the green ellipse meets the yellow circle is where we will meet up with Jupiter. The solid yellow line shows where Jupiter is in that orbit now. The green ellipse is our orbit and the solid green line shows our current position in that orbit. Years from now we will use a similar orbit to return to Earth. As you can see Jupiter will travel almost a quarter of the way around it’s orbit by the time we get there. We are a little under a fourth of the way to the point where our two orbits meet. Even moving at our incredible speed of over 70,000 miles per hour we have over a year to travel before we get there. Some may look at that graphic and think that it would be faster to travel in a straight line. The answer is that it would be faster. Unfortunately to do that would require more fuel for acceleration and braking than a hundred ships like Discovery could carry. In fact, any ship that could carry that much fuel would be have so much mass no rocket engine we can build could move it faster than a snails pace. Today marks a milestone in our journey as we cross the orbit of Mars and head out into the asteroid belt. The red planet itself is nowhere near this point in it’s orbit. Where Jupiter appears to be in front of us, Mars is well behind us to the right as we face forward. By the time it is in this neighborhood several months from now we will be on far side of the asteroid belt. Over the last few months Jupiter has slowly appeared to drift from left to right across the view ahead. This is because it’s orbit is roughly circular and ours is an elongated elliptical one and we continue to face the direction of our flight path. By the time we arrive in Jupiter space the giant planet will have traveled approximately one quarter of the way around it’s orbit from where it is now. After going over tracking and navigational data with Hal and mission control I have decided that a mid-course correction is not required at this point. I expect that it will not be necessary until we reach the halfway point in our trajectory. After a 13 minute 40 second burn we have 96.2% fuel remaining. The updated projections for our Jupiter encounter predict a minimum altitude of 491,000 kilometers and an inclination 39.96 degrees. The single biggest change is in our expected arrival date. Figures now show that we will be at our closest approach to Jupiter on Saturday Feb 14 2015 at 22:16:28 GMT. Jupiter now actually shows as a noticeably bright star just below the ecliptic plane in the constellation Taurus, seen in the lower left quadrant of the view ahead when we face prograde (meaning, in the direction of our flight path) in reference to the sun. HAL now agrees that our current projected course actually intersects Jupiter’s orbit on the predicted date and that Jupiter will be in that position when we arrive. He also says that due to the limitations of our instrumentation the figures cannot be precise this far out and will almost certainly change, becoming more accurate, as we get closer and make further mid-course corrections. I know he’s not supposed to have real emotions and he’s not programmed for smugness but I still sense a distinct satisfaction in his voice. He was right, mission control was wrong and nobody’s ever going to let them forget it.